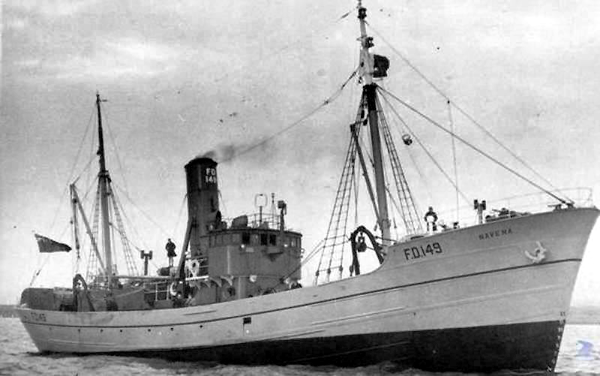 25.10.1945: Launched by Cook, Welton & Gemmell Ltd, Beverley (Yd.No.757) for J. Marr & Son Ltd, Fleetwood as NAVENA. 1.1946: Registered at Fleetwood (FD149). 27.7.1946: William R. Reader, mate, washed overboard and drowned. 21.12.1946: Landed at Hull from a Faroes trip, 747 kits grossed £2,055. 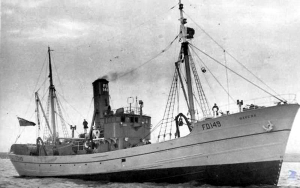 24.12.1946: Sold to Kingston Steam Trawling Co Ltd, Hull for £55,000. Outfitting and gear £1,649.13.9d. 30.12.1946: Registered at Hull (H372) (William George O’Dell, manager). 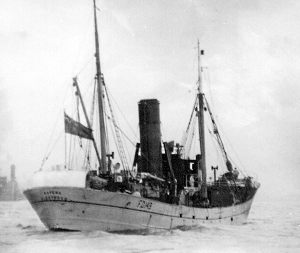 31.12.1946: Sailed for Icelandic grounds (Sk. Reuben Davy). 27.1.1947: Landed 656 kits grossed £3,051 (27 days). 19.2.1947: Registered at Hull as IOLITE (H372). 1947: 345 days 18,719 kits grossed £63,928. 1948: 314 days 17,968 kits grossed £53,299. 1.1.1949 Boiler fitted with super heaters by C. D. Holmes & Co Ltd, at Princes Dock, Hull. Cost £2,616. 11.8.1949: Sold to J. Marr & Son Ltd, Hull (Geoffrey Edwards Marr, manager) for £37,500 en bloc with ACHROITE (H81) for £35,000. Total £72,500 (through W. A. Massey & Sons Ltd, Hull, shipbrokers commission £300 on each vessel). 9.2.1951: Sold to National Trawling & Fishing Co Ltd, Cape Town for £55000. 9.2.1951: Hull registry closed (M O T Ref GSP66701). Registered at Cape Town (CTA31). 1969: Stripped of all usable parts and non-ferrous metals. 21.3.1969: Scuttled at ‘Irvin Johnson’ artificial reef in False Bay. 16/01/2009: Page published. 3 updates since then. 15/06/2017: Removed FMHT watermarks from images. This entry was posted in Lost Vessels, Steam Trawlers, Steamers (Picture) and tagged Lost, Marr on January 16, 2009 by Fred Smith.